At the Martin Luther King, Jr. historic site in Atlanta, water leaks are causing walls to crack and floors to warp. The damage is so bad that it forced the closing of the civil rights figure's birthplace for several months in 2016 because of the damage. The repairs could cost as much as $14 million, according to the National Park Service. At Yellowstone National Park, pipes carrying water and waste burst, in some cases leaking wastewater into nearby streams. The park's water systems, buildings, and roads are in need of repairs that the Park Service says could cost as much as $515 million. In Grand Canyon National Park, the only water pipeline to a village of almost 20,000 people breaks several times a year, according to the Interior Department. Trails, campgrounds, and scenic overlooks also need to be updated to keep up with high attendance at the park. Repairs could cost as much as $329 million. 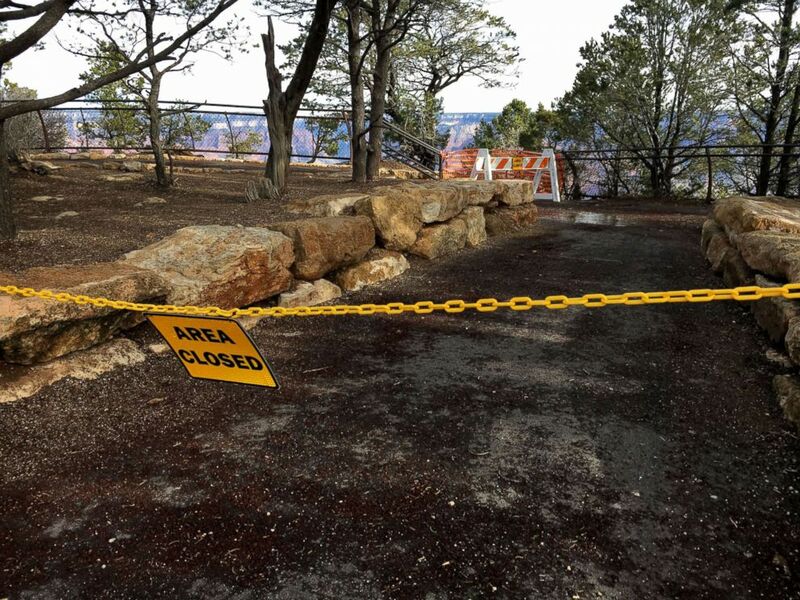 A Grand Canyon observation area is closed due to repairs. Hundreds of national parks around the country have roads, bridges, and historic buildings desperately in need of repair. But budget shortfalls have led the Park Service to put off or defer much of that work, creating an $11.6 billion maintenance backlog for parks across the nation, according to the Interior Department. One national park with the greatest amount of deferred maintenance is the National Mall in Washington, D.C. The Park Service estimates it needs more than $657 million to maintain memorials, sidewalks, gardens, and seawalls separating the Mall from the Potomac River. "I think the National Mall and national parks often are the first impression for international visitors that come to our country," Sen. Steve Daines, R-Montana, chairman of a national parks subcommittee, said at a hearing Wednesday. "The first place they go is our national parks. It's their first impression of America, and they'll see our crumbling infrastructure,"
Multiple bills to provide more money for national park maintenance are working their way through Congress, with support from Interior Secretary Ryan Zinke, who has said such funding is a priority. 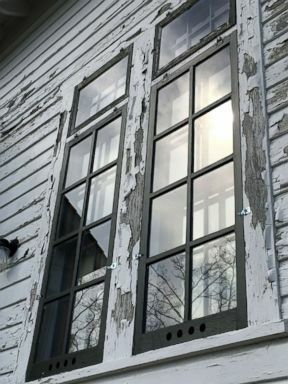 Paint is seen cracked and chipped along the window and siding of the Sleeping Bear Point Coast Guard Station Maritime Museum. One of those bills in the Senate, nicknamed the Restore Our Parks Act, would direct a portion of money from energy production on federal lands to the park service specifically for addressing the backlog of maintenance. The bill's new maintenance fund would not cover all of the backlog, but could provide 50 percent of energy revenues, up to $1.3 billion a year. The proposal also includes the option for private companies or members of the public to donate money or services to help with maintenance at national parks. Infrastructure has been listed as a priority for the Trump administration and Zinke worked with members of Congress to introduce a legislative fix for national parks funding. The Park Service for its part proposed significant fee increases to help pay for park maintenance, but later backed off after public feedback was mostly negative. "Park infrastructure is about access for all Americans," Zinke said in a statement. "In order for families, children, elderly grandparents, or persons with disabilities to enjoy the parks, we need to rebuild basic infrastructure like roads, trails, lodges, restrooms and visitors centers. This is not a Republican or Democrat issue, this is an American issue, and I think that the bipartisan body of lawmakers who put this bill forward is proof." 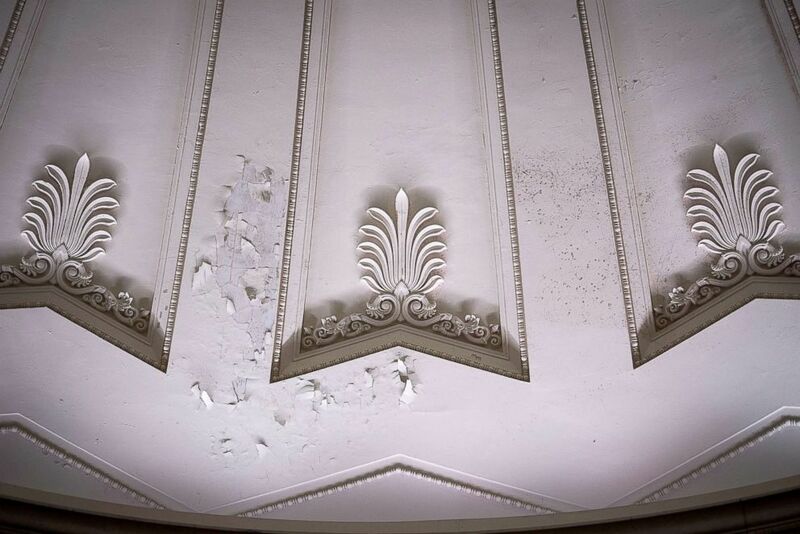 Paint is seen chipping and cracking on the ceiling of the Federal Hall National Memorial. The Senate bill still needs to be voted out of committee and, if it passes, scheduled for a floor vote. Senators were optimistic at hearing that the Restore Our Parks Act has bipartisan support, with one senator saying, "It would be great if this bill had about 98 cosponsors." Sen Lamar Alexander, R-Tenn., said that although the Senate has a busy and even partisan time ahead of it this summer, with enough bipartisan co-sponsors the bill's supporters could convince Majority Leader Mitch McConnell to bring it up for a vote. 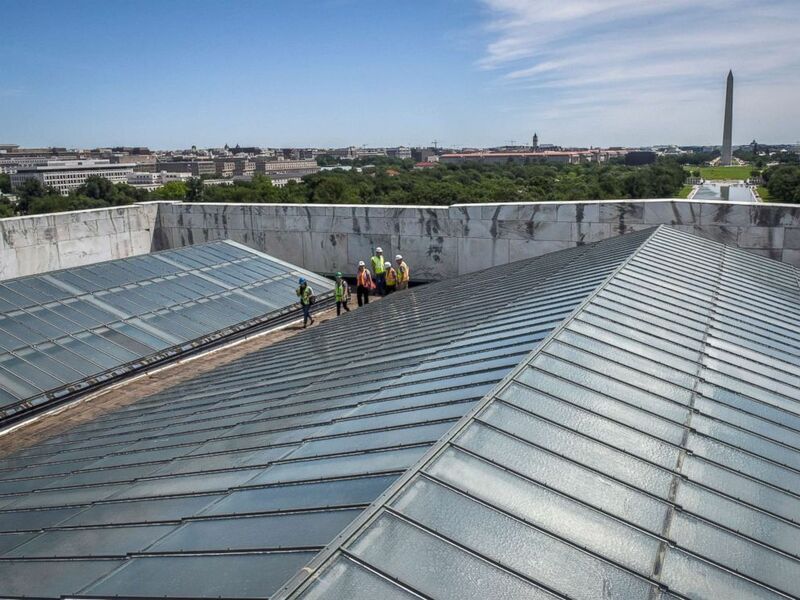 Reporters and officials walk between the skylights on the roof during a tour of on-going work on the rehabilitation of the Lincoln memorial, June, 14, 2018, in Washington, DC. "I think we've got a very good product. You support it, the administration supports it, this is pretty a unique circumstance so we've got a pretty good product," said Alexander, who previously introduced a similar bill. A similar bill is awaiting a vote in a House committee, but that bill would put energy revenues into a deferred parks-maintenance fund only if the revenues if it exceed a certain target for that fiscal year. For example under that bill in the 2018 fiscal year, revenue from energy activities on federal land would go into the national parks fund only after revenues exceeded $7.8 billion.